Author note: This recipe can also be found in The Dallas Morning News along with two other okra recipes. Click here for the story and recipes. Combine the salt and ginger into a small ramekin, set aside. Place the 1/2 tablespoon sesame oil, 1/2 tablespoon canola oil and the garlic cloves into a large non-stick skillet. Cook over medium heat for 5 minutes. Remove the garlic. Increase the temperature to high heat. Once the pan is hot, add 1/2 the batch of okra to the pan, face side down. Cook for 2-3 minutes (or until the okra is charred). Flip the okra and sprinkle with half of the salt and ginger combination. Cook for an additional 2-3 minutes, or until charred. Remove the okra into a large bowl. Add the remaining oils to the pan. Once the oil is hot, cook the last 1/2 of the okra in the same manner as before. 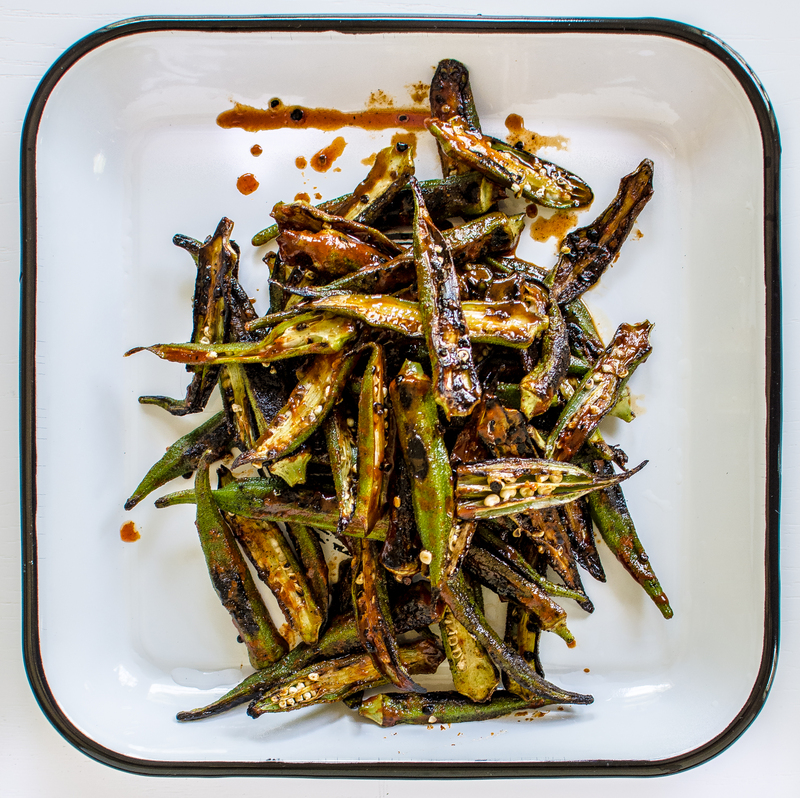 Once the okra has been cooked, toss with 2 tablespoons of gochujang sauce. Serve immediately. Add all the ingredients together into a bowl. Stir well to combine. Store in an airtight container in the fridge for up to 2 weeks. This entry was tagged A Pleasant Little Kitchen okra recipe, charred gochujang okra, charred okra, dallas food blog, dallas food blogger, gochujang okra, gochujang recipe, okra recipe, okra recipes, texas food blog, texas food blogger. Bookmark the permalink.